No one had heard of Chowchilla until the summer of 1976 when America’s largest mass kidnapping for ransom occurred there: a busload of children was kidnapped. Driver Ed Ray, a local farmer, stopped the school bus when he saw a white van apparently broken down. Then a man, carrying guns and with a nylon stocking stretched over his head, approached. The gunman told Mr Ray to move to the back of the bus. Two more masked men appeared from the broken-down van and got onto the bus. One of the men drove the school bus down Avenue 21, while a second watched Mr Ray and the 26 children, between the ages of six and 14. The third man drove the white van. After a short distance the children were transferred to two separate vans whose windows had been blacked out. At 4.15pm the two vans set off on what would be an 11-hour journey to Livermore, California, to a quarry fewer than 160 km (100 mi) from the site of their abduction. When they arrived, Mr Ray was told to take off his trousers and shoes and climb down a ladder sticking out of the ground into what appeared to be a cave. The cave turned out to be a Palo-Alto Transfer and Storage Company truck. The van was 7.6 m (25 ft) long and had bread, water, cereal, crisps, mattresses and a portable lavatory. The latter was too late for some of the children who had soiled themselves. At 6pm worried parents alerted the police and the bus was found just after 8pm 15 km (9 mi) miles west of Chowchilla. The police search was called off when the area was hit by a freak storm. As night fell some of the older schoolgirls attempted to comfort the younger ones by having a singsong. Ed Ray and some of the teenage boys began to dig their way out of the tomb but it took them 16 hours. They walked to the guard’s hut at the entrance to the quarry to alert the authorities. Meanwhile, the kidnappers had been unable to phone in their demands for a $5 million ransom to the Chowchilla police because the lines were always engaged with worried parents and journalists. The kidnappers had not thought their victims would escape and so had made little attempt to disassociate themselves from the vans or from the buried lorry. At 4am on 17 July the hostages were returned to their loved ones. Mr Ray was hypnotised and managed to recall the registration number of the first van and all but one digit of the second. Both vans were traced to a car dealer in Oakland, California. Police soon found the man who had bought the three vehicles, Mark Hall. Hall was 24-year-old Frederick Newhall Woods IV, the son of the quarry’s owner. A number of the children remembered that the kidnappers had used the names Fred and James. This led to the brothers Richard Allen, 25, and James Schoenfeld, 23. Richard Schoenfeld surrendered on 23 July and James was arrested on 29 July. That same afternoon Fred Woods was arrested in Vancouver. James was to tell a local paper, “I said to myself as soon as the bus stopped, ‘What have I got myself into?’ Then you rationalize. You see them and you rationalize all your problems will be over in 24 hours.” The three pleaded guilty on 25 July 1977 and agreed not to have a jury trial. 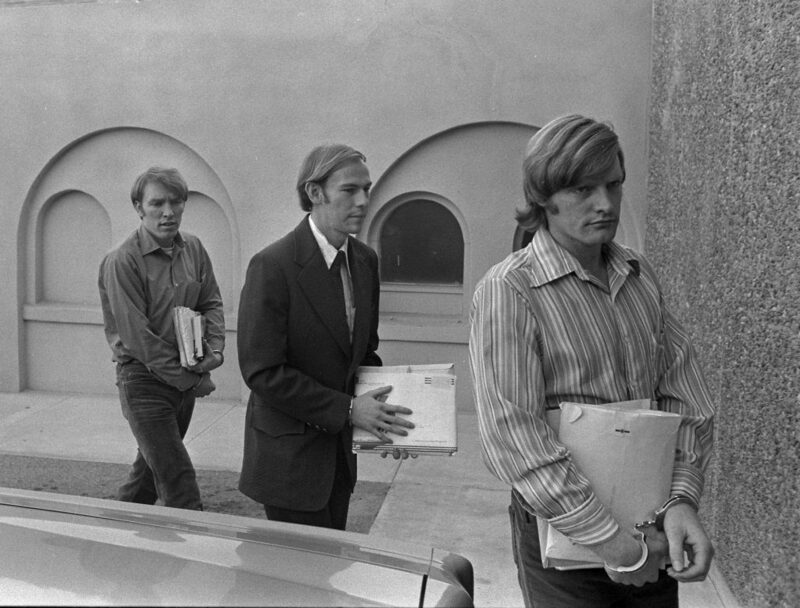 On 15 December 1977, after 16 days of testimony, Judge Leo Deegan sentenced all three to life in prison — Woods and James Schoenfeld without possibility of parole. In 1981 they were told they might get parole and indeed the California Board on Parole Hearings deemed Richard Schoenfeld suitable for parole on 30 October 2008. When the hostages were driven to the nearby Santa Rita Rehabilitation Center for medical checks and food,they were taken in a bus!